Legato is a great skill for guitar players to incorporate into their arsenal and comes in many forms; the word translates to “tied together” meaning the player is linking a sequence or series of notes without any gaps between them. For this lesson, we’ll be using 3 different techniques to achieve legato: hammer-ons, pull-offs, and slides. Most guitarists will see legato in various song transcriptions but may run into issues early on with stamina or finger strength. The following exercises are designed to target the strength and stamina in your left hand. They will increase your ability to perform some wide stretches, ensure your legato note volumes are consistent and boost your overall left-hand strength. As with all strength and stamina exercises, the key is to not over do it. Start out slowly with a metronome (more on this towards the end of the lesson in the “Practice Tips” section). For the first 2 exercises we’re going to use the Minor Pentatonic shape. The exercises are written in the 5th position (A), but if the stretch to the 8th fret is initially too wide, you can move the whole thing to a higher register. For this exercise, you’ll be playing the notes of the minor pentatonic scale by picking the first note of each four-note grouping and using your fourth, or third finger, to hammer on and pull off the higher note. Starting on the low E, you’ll be picking the 5th fret (the first note of the scale) and using your fourth finger to hammer on to the 8th fret. Once on the 8th fret, you’ll be doing a pull off back to the 5th followed by another hammer on. Repeat this on each string until you reach the high e. Once there, the pattern then descends. Each phrase will now start with a pull off from the 8th fret to the 5th; this will be followed by hammering back onto the 8 and pulling off once more. Repeat across all the strings until you reach your starting note again. A great additional exercise would be to try this with the other four minor pentatonic shapes, but remember to take it easy so as not to strain your fretting hand. Sticking with the same scale shape but instead of using hammer-ons and pull-offs, we will now be using slides. On each string, you’ll be playing the first note of each four-note grouping, sliding up to the second, then back to the first and up once more to the second. This exercise can be completed with any finger, but I would recommend repeating the exercise several times, changing the left-hand finger each time. This will build up strength in each finger when it comes to slides. Use only one finger at a time to complete the whole exercise. Assuming that you completed Exercise 2 by using your little finger, this exercise will combine what you did in the first two examples. Sticking with four note groupings, you’ll be picking the first note of each group; this will be followed by a hammer-on with your little finger (for any 8th fret notes) or third finger (for any 7th fret notes). Once the hammer-on is in place, you’ll be using that finger to slide up to the next note and back down. The notes that you slide up to are from the second shape of the minor pentatonic. Aim to keep the hammer-on and slides consistent so the four note groupings contain 4 distinct notes of the same length. This exercise is a real stamina builder; it’s made up from the notes of the A minor scale (A B C D E F G) played along one string. Each note is a repeated hammer-on and pull-off to the next note of the scale –this is known as a trill– each trill will last 1 bar (4 beats), the speed of the trill is up to you but try to stick to your usual note groupings (1/4, 1/8, 1/16) so the trill is rhythmic and even across the bar. Start slowly with this; you don’t want to start too fast and burn out before you get to the top of the scale. When practicing this, take short breaks between repeats as this will put some strain on your left-hand tendons. After a few days you should feel you’ve gained a little more stamina. You can repeat this and alter the speed of the trill and the overall speed you’re playing through the bars to suit. This exercise combines multiple hammer-ons and pull-offs, sticking to 4 notes per beat (16 notes per bar). This will take a little practise to get the coordination and the consistency between note lengths. You want every hammer on, pull off and slide to have the same note duration so you get an even 4 notes per beat across the whole lick. Start slowly and work the speed up step by step. This Exercise is based on the A Major Scale (A B C# D E F# G#) laid out with 3 notes per string. The scale is played in triplets (3 notes per beat) with ascending hammer-ons, then descending pull offs. The A to C# is a 4-fret stretch, which will take some getting used to, especially at high speeds. Start slowly and use your little finger to reach that C# note on the 9th fret of the E.
This exercise is a repeated lick. It’s based on a minor pentatonic shape with a b6 added on the 6th fret of the B string. This is based on licks in the style of Eddie Van Halen/Paul Gilbert and isn’t strictly all legato but the legato flurries on the B string will certainly mean this lick will be speedy in no time. Start slowly to establish an even note length across all the notes, we’re doing 4 notes per beat again here. Each beat comprises of a picked note on the E or G strings, followed by a 3-note hammer-on or pull-off flurry. This is another lick in the style of Paul Gilbert, this time it’s ascending triplets up the D and G strings with notes taken from the A Natural Minor scale with an added F# (4th fret and 16th fret on the D string). Pick the first note in each group and hammer on the rest. In this exercise you’ll be doing 3 notes per beat for the duration of the lick. There are some big stretches here so start at a slow pace to get the stretched legato notes clean and strong before you focus on building up speed. This last example is the big one. We’re combining some longer legato passages, wide stretches and some slides. This lick is only 4 bars long but contains 48 notes! Pay close attention to the 9 note legato groups in the first 3 bars to ensure the flow of the notes is right. In order to maintain the note volume for 9 notes of legato you’ll need a strong left-hand technique when doing the hammer-ons and pull-offs. The last bar starts with a slide up and down before entering a descending legato run. This lick is all triplets, so you’ll be hitting 3 notes per beat. When practicing this, start very slowly to ensure the notes are clear. You want the longer legato passages to maintain the volume between notes. Warm up before attempting legato exercises. Legato can put strain on your left hand while you build up the strength and stamina. Follow your usual warm up routine before diving into this lesson. Each exercise can be completed with a metronome. All are 4 notes per click except Exercises 6, 8 and 9 which are arranged for 3 notes per click. Start your metronome off at a slow pace and focus on getting the notes clear. Legato is a skill you don’t want to rush. You want your left-hand movement to be clear, concise and accurate. You also want to build up the strength and stamina. The first couple of times running over these exercises are designed to push you and make you struggle. Break the tempo down, focus on the notes and getting them all the same length and ensure they retain their volume in the longer legato passages. Practice with a clean tone, overdrive/distortion will hide any sloppy legato playing. Playing on the clean channel will also allow you to hear any issues with any notes. Finally, take regular breaks as this exercise will be tiring. You will feel a lot of strain on your wrist and tendons. You don’t want to overwork them. You’ll know when you’re at your limit with these. When that point arrives, take a break. Leigh Fuge is Head of Content and one of the music teachers behind the mgrmusic.com platform, the #1 online community for music teachers & students in the UK. 34,500 music students nationally and hundreds of music teachers from across the world use the platform. He is responsible for creating and managing content for the MGR platform and providing content for MGR partners. 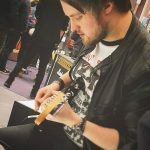 He is also a UK based guitar tutor for his own company www.swanseaguitarlessons.com and a touring musician.